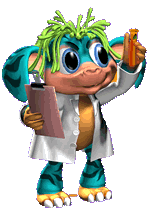 A creature's biochemistry is the collection (sum total) of its chemical reactions. A realistic biochemistry with analagous chemicals, emitters and receptors to the real world is a big part of making creatures act realistically, because when their brains are linked up to monitor chemicals they can decide things like "maybe it would be a good idea to eat some food when my glycogen level is low". This is also a good place to look when creatures are behaving oddly, as a mutation may have caused a positive reinforcement loop in their brain regarding ideas like walking into walls. This page was last modified on 3 May 2018, at 22:04.